As a woman, cellulite is often something we can’t escape from. If your ‘orange peel’ skin is getting you irritated and annoyed then, Lanaform’s unique and effective range of slimming fabrics and shapewear will transform your figure and give you back that confidence you might have lost! At StressNoMore we stock the entire range – there is every style and cut you could hope for, so you can look fantastic in whatever you choose! 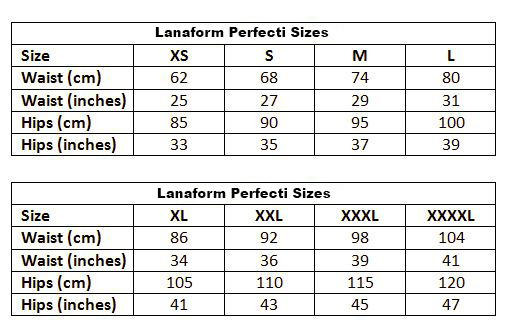 Lanaform’s cellulite reducing clothes are a huge hit across Europe due to many different choices of garment to suit your taste; we’ve brought them to the UK so that we can look as chic and slim as our continental sisters! The special intelligent tissue fabric works by incorporating three types of material – a polyester outer layer, latex layer and a cotton/polyester blend for the lining. This creates a warming effect that will help your body to reduce water retention and get rid of the bloating that makes cellulite stand out. There is also a micro-massage effect when you move, which increases your blood circulation and lymphatic drainage. These processes remove waste and excess fluid from your body, draining fat and getting rid of the dimpling effect of cellulite. Your skin will look fresh and glowing as all the toxins are removed. The Perfecti Slimming leggings are perfect if you are looking to round off those glutes, or slim down those thighs! Lanaform conducted a laboratory study to prove the effectiveness of the slimming fabrics, it was discovered that when women wore Lanaform’s slimming garments every day for 28 days they lost up to 7cm (2.75 inches) from their thighs! Perfecti slimming leggings come in 8 sizes, so they’ll be your new best friend whatever shape you are. They are machine washable so it’s easy to keep them looking and feeling great.